National Welding Month is about taking the time to recognize and reflect on the impact welding has on our daily life. Every day in thousands of shipyards, automotive assembly plants and construction sites, skilled welding professionals are working to build the structures and products on which the American economy depends. These professionals are behind the scenes welding the very backbone of industry and your world. The month of April is a chance to spotlight the welding industry’s past, present and future through education, mentorship and recognition. National Welding Month is an important opportunity to highlight a growing industry in dire need of more skilled tradespeople. Today, most people are largely uninformed about welding and the variety of professional opportunities available. We need your help to promote the importance of welding to the US economy and to all of our lives. The industry is predicting a shortage of over 450,000 skilled welding professionals by 2022. By spotlighting the opportunities available in our industry, we can create a better future for welding and the professionals that choose welding as a career. How will AWS mark this occasion? To celebrate our 100-year anniversary, we're giving qualified* CWI Exam applicants the opportunity to take our CWI Seminar for FREE. Space is limited to 60 candidates and the registration deadline is April 24, 2019. Conditions apply, see here for details. Employers will receive 50% off on any job posting at jobsinwelding.com during the months of April and May 2019. 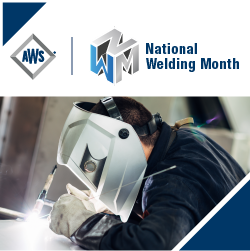 Additionally, AWS will celebrate and recognize National Welding Month via our publications, social media, and other channels throughout April. We invite you to join in on our social media promotions by sharing pictures and details about your own celebrations with us. You can help by using the ideas and resources that we’ve provided below to highlight welding professionals, welding technologies and the welding industry. Together, we can make sure the conversations started during National Welding Month resonate well beyond April. For more details about National Welding Month, including ideas for getting involved, view below. How to Get Ahead Using the American Welding Society! Scholarship Postcard – outlines programs available for welding education funding. Welder Workforce Grant Postcard – Grants up to $25,000 available. If you would like to order copies of either postcard, please contact John Douglass at jdouglass@aws.org. We are encouraging sections to check with their State and/or Local Officials and request an official proclamation of April as “Welding Month”. In the case of San Antonio, a faxed request was all that was needed. States and local entities have different processes, so we encourage each section to contact their officials to find out what is required. Below are a few ideas that can help you promote National Welding Month in your local area. Offer a one-day hosted event at a local facility where local businesses can promote jobs available in the area. Publicize at the local schools to encourage students to come and learn first-hand about what is available in their area. If you own or have access to a manufacturing facility that uses welding as a key process, offer a one-day open house tour to trade schools in the area so students can get a first hand look at welding behind the scenes. Choose a welding student in your area to mentor for one year and report your experience during the next National Welding Month. Each subsequent year could be an opportunity to choose a new student. Use the “Key Messaging” points to send information to local media outlets about National Welding Month. If the story is picked up, send us a link to the article or video and we will promote it on our web page. Use the “Social Media Engagement Guide” to promote National Welding Month through your own social media outlets. Read the “Contacting Your Government” section for direction on how to get local government involved. Hold a fundraiser to create a named scholarship with the AWS Foundation that provides funding for welding students. Send them to nwm@aws.org and we will add them to our web page. Our goal with National Welding Month is to show as many people as possible how important our industry is, and how rewarding a career in welding can be. That’s why using the campaign hashtag is so important. It ensures we are all sharing a common message. The American Welding Society has created a series of videos designed to teach people about the welding profession. These videos are interviews with welders in various stages of the industry – mostly newcomers and students. The entire playlist, or the individual videos, are great content to be shared via social media. Tagging social users or pages that have a large amount of followers can potentially help amplify your message. Welding is an industry with national importance, and the welder shortage has been discussed by national media in recent years. Tagging these entities means they could share or retweet your message, and broadcast it to a huge audience. Use your social media to post about the benefits of joining an AWS section, and encourage your followers to share your message. The goal of National Welding Month is to spread the word about our industry, and there’s no better way to do that than by increasing membership in our sections. Welding is the joining of two or more materials through heat or heat and pressure, forming a bond between two pieces of metal or plastic. There are more than 80 welding processes. Welding is used to build ships, automobiles, planes and space vehicles. Welding is used in construction of buildings, bridges, pipelines, power plants and oil refineries. Welding is used in the manufacturing of small electronic devices, medical equipment, and nanotechnology. Advancements in materials, processes and equipment, make modern welding an increasingly high-tech skill. Advancing manufacturing technology creates more uses for welding in the workplace and is expanding opportunities. New materials are creating a greater need for a highly educated and innovative welder workforce. Automation reinforces the need for skilled machine operators. There is an increased emphasis on skilled workers with identifiable credentials to ensure quality. Many welders are highly skilled problem-solvers working in the aerospace, automotive, electronics, construction, manufacturing, oil and gas and shipbuilding industries. A welding career can lead to financial security, career advancement and important work in areas around the world. How will you celebrate Mational Welding Month? We want to hear from you. How do you plan to recognize National Welding Month this year? Email us your event information including date, location and photos to nwm@aws.org and we will feature it on our website.